You may not have quite got your head round robo-journalism yet – although the idea that computers are nudging journalists out of jobs is hardly new. In September, BBC News reported on how sports stories are being written by software from Automated Insights, a company in North Carolina. To find out more, I spoke to Wibbitz’s marketing director, Hilary Kay. She told me the company’s artificial intelligence (AI) software starts by shortening written news stories, usually to about 40 per cent of their original length, to create the commentary script for the film. At the same time, it identifies key figures in the story and what kind of story it is - such as news, sport, finance or entertainment. Wibbitz has also set up partnerships with large media libraries to provide stills and video to illustrate the stories. So Getty Images, for instance, has signed up with its enormous stills collection. With software developed and content partners in place, it takes Wibbitz just 10 to 15 seconds to turn a piece of text into a finished video, complete with computer-generated narration. Well, maybe not bad for 15 seconds of work? The video was created by Wibbitz as part of a demonstration for the BBC, to show how a text story from the BBC website could be turned into a film. You can read the original story here. As a business, Wibbitz offers its software to existing media companies so they can create online videos from their journalism. That way, editorial responsibility is with the corporate customers, rather than Wibbitz itself. A Wibbitz-using business can put in place whatever checks it thinks it needs before publishing a video, and can customise it too. So it can go through the video shot-by-shot to edit out anything it deems inappropriate and pick alternatives from the Wibbitz library. And if it has its own media library, it can add that archive to the mix, giving its videos a unique resource. The company plans to make money through ad revenue-share agreements with the media companies who use its software. With online video a big growth area for media – as Nic Newman was discussing on this blog - Wibbitz would seem to be onto a good thing. So is this bad news for human beings, especially those paid to create news video? Hilary was ready for my question: “These videos still require some human touch to give them the brand’s voice,” she said. In fact, Wibbitz makes an editor’s work more interesting, she claims, because the legwork is already done, “making the annoying parts easier”. Wibbitz is creating short-form news pieces, not in-depth documentaries. In fact, if the editing process for these becomes easier, it may even free up resources for more costly activities like investigative journalism, Hilary suggested. 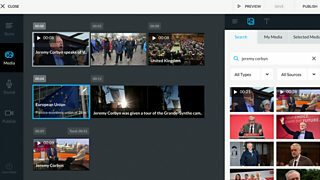 The Wibbitz video editor is designed to be something that “anyone across the organisation can use”, Hilary said. She showed me the interface (above), and it was clear that the emphasis is on ease of learning and use rather than sophisticated editing features. So, in terms of jobs, it may be that editors will find more people encroaching into their area, rather than that human beings are cut out of the loop altogether. But before you get too complacent about the impossibility of automating complex creative jobs, it’s worth reading Martin Ford’s powerful argument in Rise of the Robots - that middle class occupations in developed countries are the most at risk from AI software and robotics. Next month will be exactly five years since IBM’s Watson computer defeated two Mastermind-style champions on the US TV quiz show Jeopardy. Since then IBM has been adapting what it learnt from the project into AI products for the legal, medical and financial sectors. With progress like that, it’s plausible to believe that Wibbitz’s software will develop at a similar pace. So, what next? When will we see the first start-up dedicated to making videos for robots - to help them learn to write better stories? Hilary Kay from Wibbitz has kindly offered to let the Wibbitz software try its hand with this piece of writing, so I hope to be able to share the videoized version of this blog post before long.